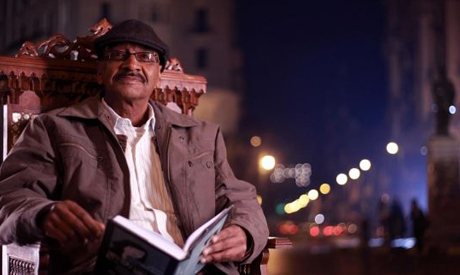 The novelist Mekkawi Said has left his seat, which he didn't change for almost 20 years, in Zahrat Al-Bustan Café in Downtown Cairo. Although he didn't suffer from any sickness, he passed away following a sudden heart attack 2 December. He died at the age of 61 and before completing several writing projects about Cairo, a city he adored and focussed on exclusively in his writing. The backstreets of Downtown Cairo and its street children remained his favourite milieu in most of his writings. Mekkawi was born on 6 July 1956 and began his literary life as a poet, writing in both vernacular and classical Arabic during his university years. His poems were published in Sawt Al-Gama'a (The University's Voice) to the extent that he was dubbed the university's poet. After graduation, he worked as an accountant for a contractor company. In this period, he began frequenting many of the famous Downtown Cairo cafés – such as Ali Baba, Souq Al-Hamidiyya and Zahrat Al-Bustan – which were flourishing at the time, with continuous literary meetings and discussions. Here he spent his youth, which proved to be the formative years of Mekkawi Said the writer. He soon started writing short stories and scripts, and – astonishingly – he abandoned poetry entirely. Some of his short stories were published, while his scripts were produced as short documentaries. The Swan Song was his most famous novel, but before this he wrote three short-story collections: Running after Light (1981), A Romantic State (1992), and The Back-Seat Passenger (2001), along with one novel, The Ship's Rats (1991). Unfortunately, these went unnoticed. So he stopped writing for a number of years, until he published The Swan Song in 2007. It became a hit, prompting him to publish 10 consecutive editions; it reached the shortlist of the Arab Booker Prize and won him the State Encouragement Award in 2008. Perhaps this novel was one of the first to plunge inside the world of Downtown Cairo’s backstreets, where street children exist and construct their secretive lives. Those foundlings, little criminals and displaced people, whom foreign activists attempt to help, are the protagonists of his novel. The novel’s setting is almost entirely confined to this totally ignored area. Thus, the reader discovers that there is another world lying just a few metres from the streets of the masters, governed by different rules, among the hawkers, glue-sniffers and drug addicts. After choosing Zahrat Al-Bustan as his haunt, Mekkawi wrote this novel. He used to eat his breakfast there and stay reading and writing until 3pm. Then he would go to a small room on the outskirts of Abdeen neighbourhood, which he rented especially to take his “holy siesta” — his only pastime. At nightfall, he would return to the café to meet his friends until late. That was Mekkawi Said’s daily routine for about 20 years. During those years he worked as the publishing manager for Al-Dar Publishing before retiring and becoming a full-time writer, as well as writing a column four days a week in Al-Masry Al-Youm newspaper. He was able to write a number of short story collections and novels, such as My little Secret, Let it be known to Everybody, The Invisibles, Cheerfulness Packs its Luggage, and To Be Loved by Jihan, which was his last novel. Mekkawi also wrote a number of books about the neighborhood closest to his heart, such as The Downtown Cairo Collections and The Tahrir Notebook, in which he wrote his observations on and testimony to the 25 January Revolution. Since he was one of Zahrat Al-Bustan café's notables, the café held a special evening as a memorial service for the loved and departed writer.